Home Photos You Guys Can Believe Me or Not, But There’s PLENTY OF SNOW to ski and ride on…for now. 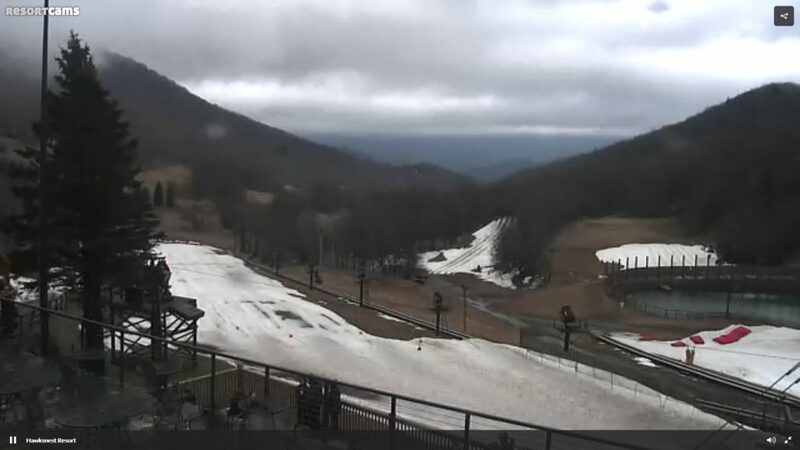 The photo above is from SATURDAY MORNING AT WINTERGREEN RESORT!!! I should add that SOME ski areas look better than OTHERS and that you should do a little “homework” by looking at the LIVE CAMS, checking the SNOW REPORT and then let your GPS take you to that ski area of choice with the confidence that you WILL have an awesome day on the slopes. I have to report on the good, the bad and the ugly…and then field the emails from those who want to praise, complain and everything in between. 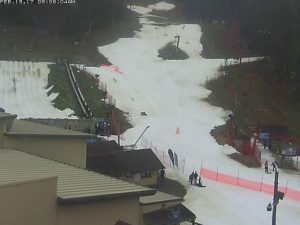 Have you seen any better tubing hill that this shot at Wintergreen Resort from Saturday morning? 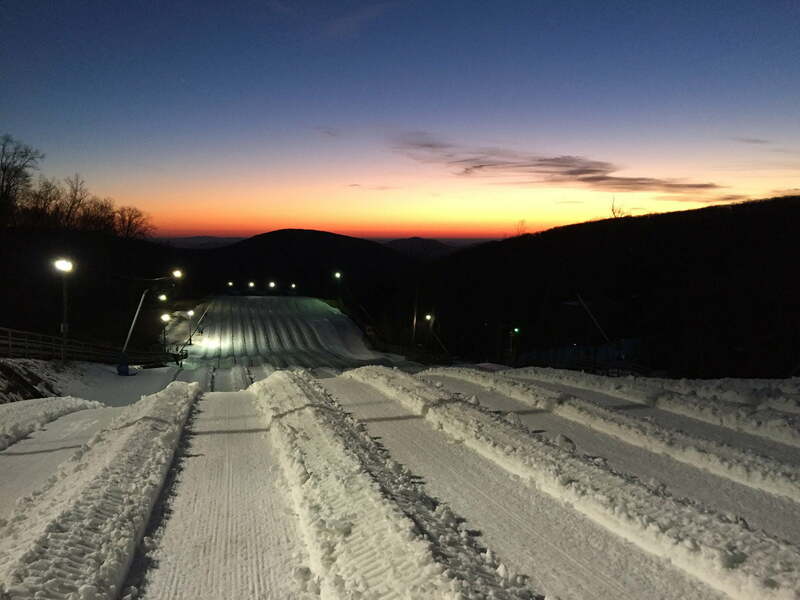 Wintergreen Resort posted this awesome shot of the tubing hill on Saturday morning! Click to Enlarge. …and then we have to share that Hawksnest isn’t even OPEN for tubing today, due to conditions. Not good for Presidents Day Weekend. They ARE ziplining though! Click to enlarge at your own risk! Joe Stevens’ “Snow News is Good News” column is posted and the title of it is “Roller Coaster Ride from Hell”. The timing of his weekly post came in this morning as I was REALLY struggling with exactly how I wanted to start my own FirsTrax mountain blog this morning. A LIVE LOOK AT OBER THIS MORNING. Click to Enlarge. You see – I was being (emotionally) tugged back and forth by several emails that I received over the last few days. I was riding waves of “verbal praise” followed by “exasperated complaint” followed yet again by “WTH are you going doing?” commentaries. I was struggling a bit for the words to come out of my keyboard. Don’t get me wrong, this isn’t brain surgery or anything and have NO illusions of grandeur in terms of where my morning posts rank in the importance of any reader’s day. However, I get enough responses in my skiMail INBOX to let me know you guys are reading this stuff. Most of the emails that I’ve received lately have come from depressed, frustrated, exasperated skiers and snowboarders who ARE NOT COMING “because the conditions are so bad”. Joe Stevens emailed me his post, followed by a text from our own Kenny Griffin who was at Appalachian Ski Mountain this morning. As you can see, the snow looks p-r-e-t-t-y GREAT at App this morning. Appalachian at 9am this morning. Photo taken by our own Kenny Griffin. Click to Enlarge! As I was reading the emails this morning I was trying to come up with a word or phrase to describe the feeling that a person gets – similar to frustration – in the face of naïveté or obliviousness. Some of the emails had me responding with a huge SIGH, while others had me with my face in my palm. “Exasperated” came to mind. Then Joe’s story posted and I think his story summed things up nicely. This HAS been a Roller Coaster Ride from Hell. It seems that MOST of my stories this season have been slanted in an attempt to convince readers that the slopes look pretty darn good. The emails I get from readers seem to think I’m a liar and paid advocate for the resorts to “preach the party line”. Again – the naïveté or obliviousness. Man, chu don’t know me very well. I know, I know – here I go lying again. 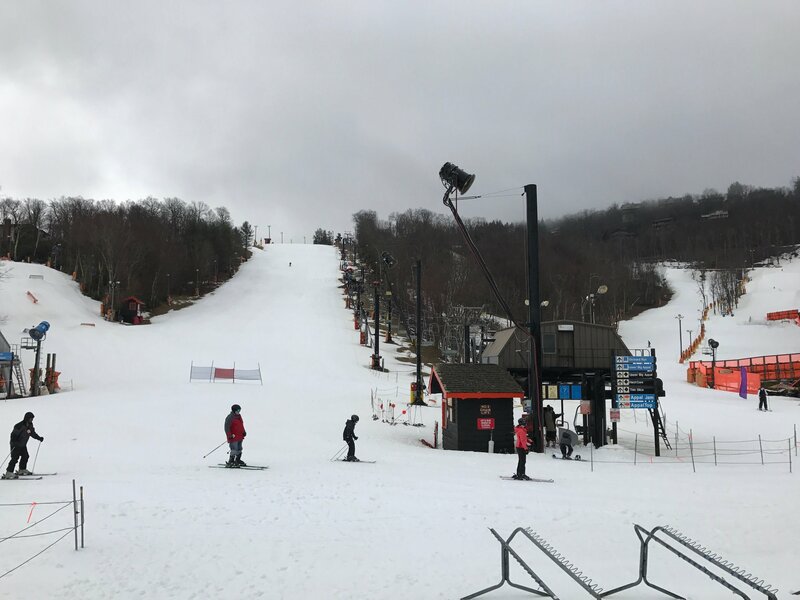 Temperatures were in the 60s and higher on Saturday and yet there WERE a couple more slopes open on Saturday than on Friday. 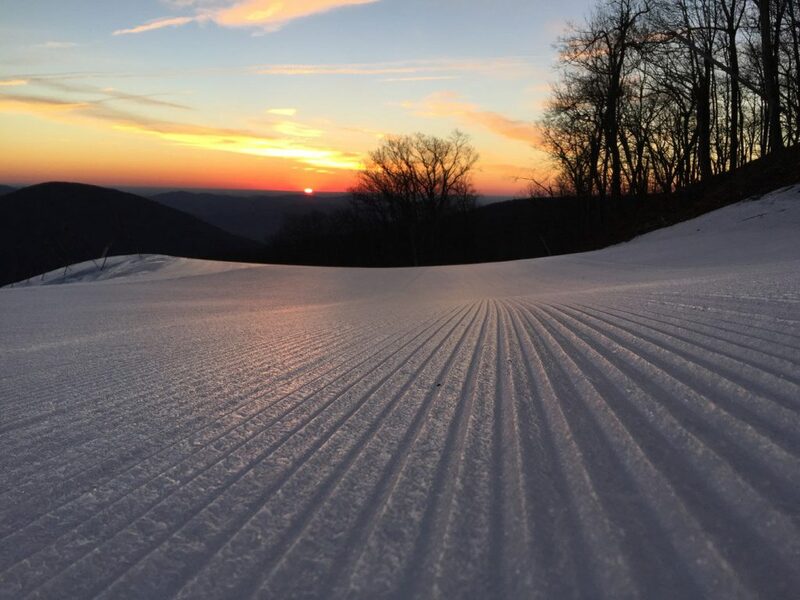 Wintergreen Resort added one more open trail. Conversely, this morning I am seeing some thin areas beginning to show at various ski areas. The crazy roller coaster that we’ve been on weather-wise has provided JUST ENOUGH cold air and snow to keep the slopes covered with good, side-to-side coverage – on the slopes that resorts choose to open. To be honest – THIS SEASON will go down as the BEST JOB EVER PERFORMED by snowmaking and snow maintenance crews at ALL of our ski areas. WHAT TO EXPECT GOING FORWARD??? Man, here’s where it gets tougher and I’m not liking the message that I have to share. I have received perhaps 100 emails in the last two days asking about when the weather will turn colder for planned ski trips that everyone wants to take. The way it looks RIGHT NOW – the best conditions of the next TWO FULL WEEKS is RIGHT NOW. In other words, things will be going downhill on that roller coaster from hell as we see NO SNOW NOR SNOWMAKING TEMPS from now through at least the first week of March. Of course we NO ABSOLUTES as to whether or not March will provide any kind of winter-cooperative whether – but from what we’re hearing from the weather gurus out there…we can expect milder-than-normal temps in all of March. It appears that Punxsutawney Phil was also a liar. Now watch it turn COLD AND SNOW. Lord we can hope, right? The post You Guys Can Believe Me or Not, But There’s PLENTY OF SNOW to ski and ride on…for now. appeared first on Ski Southeast.